I think that the main title is the clearest and most descriptive. If you think that one of the other titles works better, go for it. Are you an entrepreneur? If so, then you need to know about conversion rate optimization. Specifically, you need to know why CRO matters (because it does), and what to do about it. I'm not going to make some unreasonable demand like know everything there is about CRO! Being an entrepreneur is unreasonable enough. Instead, I want to break things down real simply into six questions and answers. The acronym CRO stands for "conversion rate optimization." What is a conversion rate? Your site's conversion rate is the percentage of users who do what you want them to do on the site (i.e., convert). The most common conversion is purchasing something on a site. Another conversion action for a different site may be to download an app, fill out a form, or join a mailing list. A single site can have multiple conversion actions. How do I figure out my site's conversion rate? Figuring out your conversion rate is easy. You just need two numbers: 1) The number of total visitors in a specific time frame and 2) the total number of conversions in that same time frame. Divide the number of conversions by the number of visitors. For example, let's say you had 100,000 visitors in one month. During that week, 1000 customers purchased a widget. Your conversion rate is 1%. 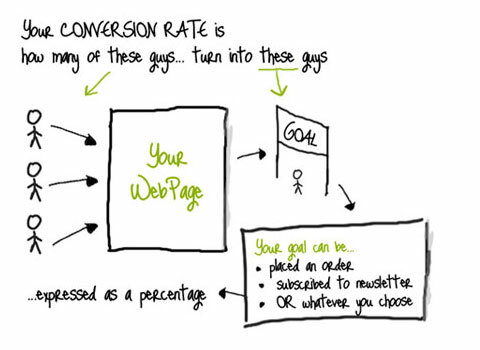 Here's how the Conversion Rate Experts sketch it out. And what about that optimization part? Optimizing your conversion rate means to make it better, to improve it. Just like search engine optimization means improving your website's search visibility to the right users, so conversion rate optimization is improving your website's ability to turn visitors into buyers. Okay. That's the boring-but-important stuff. Now, let me tell you why it matters. 2. Why does it matter? Because revenue. Period. The one word answer to "why does it matter?" is revenue. As an entrepreneur, you're concerned about revenue, profit, the bottom line. So, the million (or billion) dollar question is how do you get more revenue? There are tons of right answers. But right up there at the top of your list should be conversion rate optimization. Because if users don't turn into buyers, you're screwed. Because traffic alone doesn't prove success. Because the only way that you get revenue is if users convert. Because conversion is kind of the whole point of your website. What good is a website that doesn't convert? It's a useless waste of Internet space. If you have a business website, are you merely trying to disseminate information out of the altruism of your heart? No! You want leads, email addresses, purchases, conversions. You want people to do something. Conversion rate optimization is the process of defining that action and compelling people to do it. It all boils down to the one central goal: Revenue. Simply put, conversion rate optimization is the process of improving revenue. 3. What is involved in CRO? Testing and Improving. Now that we know what it is and why it matters, let's talk tactics. What's involved in the process of optimizing a site? There are two main things--testing and improving. This is the data phase. You want to learn as much as you can about a site's current conversion rates, analytics, KPIs, users, customer journey, etc. CROs also conduct tests to find out which changes have the best outcome. For example, they want to figure out which button people are more likely to click--a big orange button or a small green button. The CRO then runs a split test or A/B test to find out the winner. The nuts-and-bolts of CRO is making changes to the site. If you find out that the orange button converts better, then you change the button to orange. With every new test, you learn something new about the user and about your site. You make the improvement, and start testing again. You're discovering which elements of a site convert a greater number of visitors. Wal-Mart made a responsive site. CRO boost: 20%. CRO works. If you do consistent testing and make regular improvements to a site, your conversion rates will improve. 4. What does it require? A person or an agency. DIY. If you're an entrepreneur, you probably do a lot of things yourself already. What about CRO? It's doable. Lots of entrepreneurs choose to go this route. Choose a testing software, create a schedule, and start making improvements. There will be a learning curve. CRO has the potential to swallow up all your spare time and become unwieldy. Choose this route with caution. Hire an agency or consultant. Some marketing agencies specialize in conversion rate optimization. Agencies like Conversion Rate Experts and Wider Funnel help you create a strategy, start testing, and make improvements. I've spent hundreds of thousands of dollars with CRO agencies and consultants. The results have been well worth it. Hire a CRO expert in-house. If you can afford it, handpick an in-house professional who can improve your conversion rates. CRO is an ongoing activity, not a one-and-done deal. You may save money in the long run by maintaining a CRO on your payroll. More marketers today are learning how to do CRO. If you're a small agency, then your CMO or marketing manager may double as your CRO. 5. How much does it cost? Less than you might think. DIY: $10-$400/month for testing software, plus the time you spend doing it. Agency or Consultant: $2k/month--$100,000+ fee. CRO Expert as Employee: $5k-10k/month. These prices sound expensive. In reality, the cost is less than you might think. Why? Because conversion optimization pays for itself. For example, consider the UK-based travel agency Sunshine.co.uk. They were losing money during the travel industry's biggest slump ever. Conversion Rate Experts came in, shook things up and helped them earn an extra 14 million a year. CRE's fees were negligible compared to a huge upswing like that. Whatever Sunshine paid out in fees, they got back in spades. 6. How long does it take? It never ends. Conversion rate optimization is a never-ending adventure. In theory, your conversion rate could be as high as 100%. What is your current conversion rate? 1%? 4%? How much could it improve? Conversion optimization works in cycles. You test a feature, and then you make improvements. Then you test another feature, and make more improvements. Every little test and every little change can make big improvements in your conversion rate. Today, businesses have to go about marketing in a new and strategic way. That new and strategic way is conversion rate optimization. If you forget everything else in this article, here's your final takeaway. You need to be doing conversion rate optimization. Every business that has an online presence has a strategic obligation to do CRO. You owe it to yourself. You owe it to your company. You owe it to your users and customers. Make this the year that you discover all that CRO can do for you. Are you an entrepreneur? What's your CRO success story?